Author: Richard Morton at Northumbria University. The Sun’s corona has intrigued scientists since its discovery around the start of the last century. Over the years, understanding how the coronal plasma is heated to temperatures in excess of 106 Kelvin and the mechanisms which accelerate some of this plasma as it flows out into the heliosphere, forming the solar wind, have proved stubborn problems. However, over the last few decades we been able to probe the corona with a series of ever more impressive observatories designed to examine extreme ultraviolet and X-ray emission (e.g., Yohkoh, SOHO, TRACE, Hinode, SDO). Using these instruments, it has become clear that the complex magnetic field pervading the Sun’s atmosphere must play a central role in explaining the observed properties of the corona. 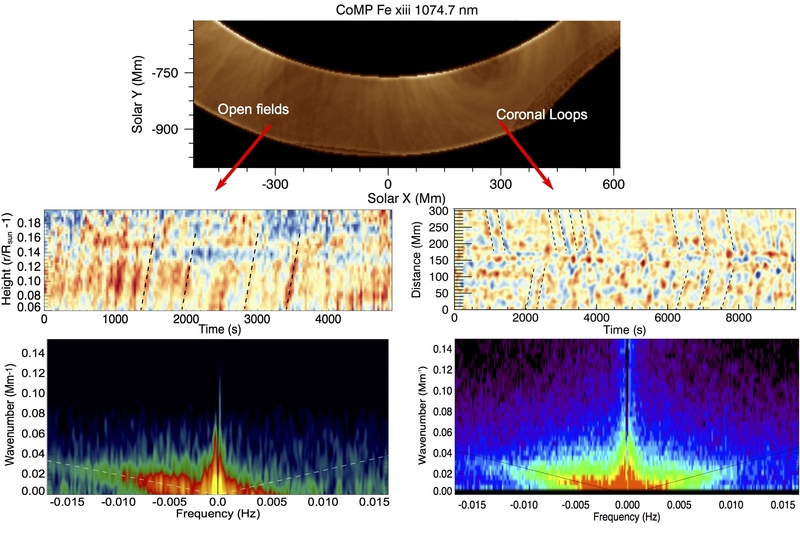 More recently, the Coronal Multi-channel Polarimeter (CoMP) has extended our range, providing spectroscopic imaging in the infrared (Fe XIII 10747 Å) and some of its first results uncovered a potentially key component for understanding the dynamics of the corona. Figure 1 Doppler velocity signals in the corona. The CoMP field of view is filled with fast (v~v_A~400 km/s) propagating velocity signals. The top panel shows a typical intensity image of the corona from CoMP. The left hand panels show the predominantly unidirectional propagation of Alfvenic waves in open field regions (middle row) and the corresponding Fourier power (bottom). The right hand panel displays the much clearer counter-propagating signals found in closed coronal loop systems. Dashed lines highlight propagating features in middle row panels. Many mechanisms have been proposed to deliver the required the non-thermal energy to the corona, one such mechanism being magneto-hydrodynamic waves – in particular incompressible transverse (or Alfvénic) waves. Hypothesised in the 1940’s, such wave modes were identified only rarely in the Sun’s atmosphere in the late 90’s . In 2007 the unique ability of CoMP demonstrated the presence of ubiquitous quasi-periodic velocity fluctuations throughout the entire corona, propagating with speeds well in excess of the coronal sound speed (~120 km/s) and interpreted in terms of Alfvénic waves (in particular the kink mode) . In Figure 1 we show the typical properties of the Doppler velocities observed for systems of coronal loops and open field regions. The coronal loops have a herring-bone pattern, demonstrating quasi-periodic velocity signals propagating upwards along the loops from both foot-points [3,4]. The 2-dimensional Fourier power for one half of a loop indicates that there are counter-propagating waves along the entire loop – as shown by the two strong ridges in both positive and negative frequencies in the frequency-wavenumber domain. In contrast, open field regions show a predominantly unidirectional propagation of the velocity signal, and only have one prominent ridge in Fourier power due to a strongly anisotropic wave propagation outwards from the corona . However, power is present for the positive frequencies (inwardly propagating), suggesting that some counter-propagation exists, albeit with the inwardly propagating waves being much weaker. In both cases, the presence of counter-propagating waves provides support for the idea that plasma heating via Alfvénic turbulence wave may occur in many parts of the corona. 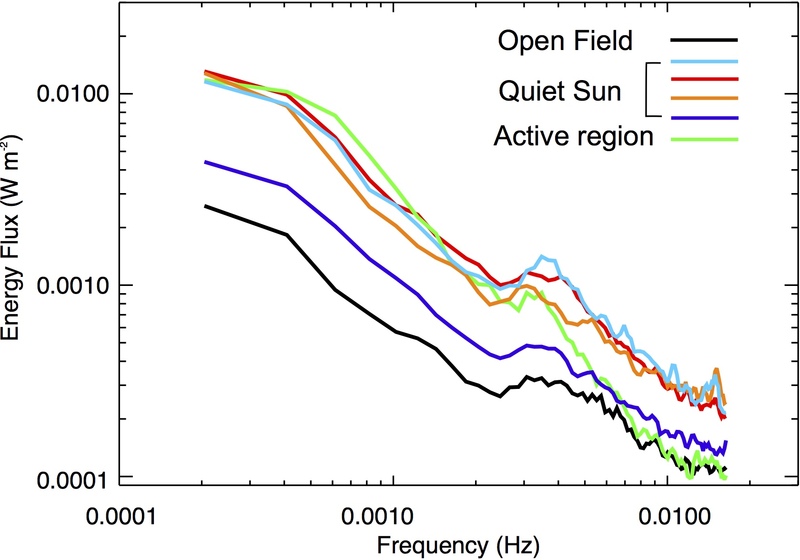 Figure 2 Measurements of wave energy flux through different coronal regions, i.e., active region, quiescent corona and open field regions. The presence of an enhancement in power around 3-5 mHz is evident in all spectra. See . The Doppler velocity time-series of CoMP can be exploited for frequency analysis through Fourier methods, enabling the derivation of coronal velocity power spectra. In combination with the density diagnostics provided by the ratio of the Fe XIII 10747 Å and 10798 Å lines, these power spectra can be converted to relative wave energy fluxes as a function of frequency in the corona . In Figure 2 we show the wave energy flux for different coronal regions, revealing that the relative wave energy flux is highly inhomogeneous across the corona. We find evidence that the energy flux appears to be least in the coronal holes, and that the quiet Sun typically has larger total fluxes than active regions. While CoMP cannot provide the actual energy flux due to under-resolution of Doppler velocities , such measurements have the potential to provide rigorous constraints for wave heating models in different magnetic geometries. The energy flux spectra also reveal a distinct enhancement around 3-4 mHz present in all of the corona power spectra, which breaks the power law behaviour. It is believed that this is due to the mode-conversion of p-mode energy to Alfvénic waves which may occur in the lower solar atmosphere [5, 6, 8]. However, this phenomenon requires additional investigation. While study of the waves can tell us about the flux of non-thermal energy through the corona, they can also be exploited for magneto-seismology. One example of this is the measurement of plasma flow in the corona. The presence of counter-propagating waves provides a unique and simple methodology to estimate flow speeds along coronal magnetic fields. If there is plasma flow along a waveguide, then any waves found to be propagating along the same waveguide will be influenced by its presence. Waves propagating with the flow will have enhanced propagation velocities, and those against the flow will have their velocities retarded. A straightforward analysis of the counter-propagating waves speeds reveals that, typically, either the forward or backward propagating waves are moving faster/slower than the other. It is then trivial to provide an estimate for coronal plasma flow speeds. This has significant advantages over measuring such speeds from imagers, which typically use intensity enhancements as a tracer of the plasma flow. But such methodology is hampered by changing emissivity of the plasma along the magnetic field and potentially misleading locations of plasma ‘packets’. Figure 3 displays measurements of the flow of plasma from an open field region in the corona. The plasma is flowing predominantly outwards, suggesting it may be the beginnings of the solar wind in the low corona. Figure 3 Measurements of the outflow in coronal holes from CoMP utilising the forward and backward propagating waves for magnetoseismology. Note, large flows near occulting disk are an artefact. Full details available in . The currently published studies with CoMP data show that imaging spectroscopy of the corona in the infrared has the potential to provide unique insights into the dynamics of the coronal plasma and magnetic field. A huge catalogue of CoMP data now exists (http://mlso.hao.ucar.edu/mlso_data_COMP_2016.php) and it is my view that this great resource will lead to many discoveries that will change our understanding of the flux of Alfvénic wave energy through the corona and its role in heating the coronal plasma. In addition, it is clear that in combination with other diagnostics, such an instrument can provide significant constraints on the mass, energy and momentum flux out into the heliosphere and improve our knowledge of the mechanisms which supply and sustain the solar wind. With planned upgrades to the current instrumental set-up and the future plans for the Coronal Magnetism Observatory (COSMO – https://www2.hao.ucar.edu/cosmo), the future looks promising for understanding how MHD waves influence the dynamics of the coronal plasma and the onset of the solar wind.